1 2 3 "About BPS". Buddhist Publication Society. Retrieved May 24, 2015. ↑ https://m.youtube.com/watch?v=6U8-GTX5Puw , time 6:53. 1 2 3 4 "Ven. 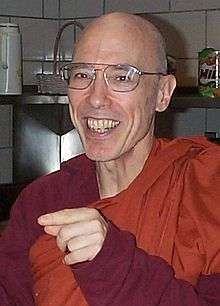 Bhikkhu Bodhi". Bodhi Monastery. Retrieved May 24, 2015. 1 2 3 4 "Climbing to the Top of the Mountain". The Barre Center for Buddhist Studies. Archived from the original on April 17, 2012. Retrieved May 24, 2015. 1 2 In Bodhi, Connected Discourses (2000), p. 5, Bodhi dedicates the tome to "the memory of my teacher Venerable Abhidhajamaharatthaguru Balangoda Ananda Maitreya Mahanayaka Thera (1896–1998) and to the memories of my chief kalyanamittas in my life as a Buddhist monk, Venerable Nyanaponika Mahathera (1901–1994) and Venerable Piyadassi Maha Thera (1914–1998)". 1 2 "BPS "Newsletter" (1st Mailing 2008, No. 59)" (PDF). Note: The author [Ven. Bhikkhu Bodhi, related to the article "The Buddhist Publication Society of Kandy: A Brief Account of Its Contributions to Buddhist Literature," pp. 4–7] served as the editor of the BPS from 1984 until 2002 and has remained its president since 1988. ↑ "Lecture on Vesak Day by Ven. Bhikkhu Bodhi". Buddhanet. Retrieved May 24, 2015. ↑ "BAUS President Ven. Bhikkhu Bodhi, 2013 -". Retrieved 2016-09-08. ↑ "Buddhist Global Relief". Retrieved May 24, 2015. 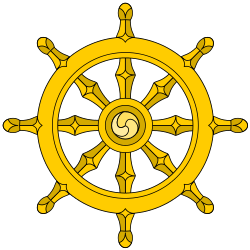 ↑ "The Noble Eightfold Path The Way to the End of Suffering". Access to Insight. Retrieved May 24, 2015.